Payment Manager allows admins to make on-demand charges in a Lessons account. In the side menu, click Team Admin > Lesson Admin. Search for the desired Account. Fill in the fields and click Save Changes. Click View in the Charge/Credit column for that Account. Click [Pay Balance] on next screen. Change Payment Type to Credit Card if needed. 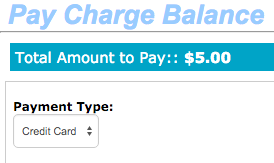 To use an existing card, click Use this card by the desired CC. Or click Add New Card, fill in the details (click Copy From Account Info to quickly fill in name and address), and click Save. Click Pay NOW, then click OK to confirm. You will see a confirmation screen when it finishes processing. When you click the HERE link you will see the balance paid. You may then close the window. Lessons - Do additional credits or charges apply to recurring billing? Lessons: Why didn't an additional credit/charge apply to lessons account at checkout? Lessons - I moved my athlete but the payment screen did not show. What order are Wait List students in? How do I view? Can I delete classes in lessons? Lessons: How do I delete [Not Assigned] instructor from registration page? Lessons - Do financial transactions from Lessons get included in the QuickBooks iif file? Lessons: Can I delete an account or student? How do I hide the Annual Registration Fee wording on Lesson Home Page? Lessons: How can I know when new students register? Can I access an account from the classes tab? 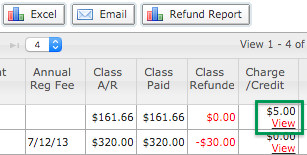 Lessons: How can I generate a refund report? Lessons - What is Class Manage? How do I email the instructors? How can I hide the open slots on the public facing view? How do I view the user defined fields in Lessons? Lessons - Can I enforce the middle name during registration? Lessons - Can I generate a report showing Curriculum items? Lesson - Can I create/Clone a class with no or a zero fee associated with it? Lesson - Can I hide the instructor tab? Lessons: How can I view account revenue and student information? Lessons and How do I see the Full Heat map? Lessons: How do I export a report that shows the medical notes? Lessons - Why aren't my classes showing? Lessons - How do I print or view legally binding agreements? Lessons - How do I Add more registration spots to a class? Lessons - How do I turn off classes or disable them? Lessons: Convert Member / Can I push my lessons student to my Account Member Admin? Lesson - I registered swimmers under my admin Account! Lessons - How do I delete a Class? Lessons - Why can't I see my Swim Lessons button or tab? Lessons - What is curriculum? Lessons - What is a Heat Map? Lesson - What is a Program / Subprogram / Class? Lessons - How do I add a waiver and make it optional or required? Lesson - How do I add an Instructor? How do lesson sessions work? Lessons: How do I print an instructors report? Why isn't my swim lesson module turned on? © TeamUnify | The World Leader in Swim Team Management. All Rights Reserved.